• Remote Switch Box with 9′ Cable allows you to power on dust collector without having to use the main power switch on unit. Has PSA backing for positioning in convenient location near your work. 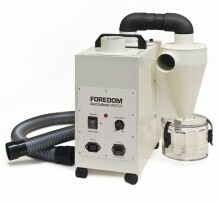 Foredom Bench Lathe Kit, 230 Volt. Click the button below to add the Dust Collector with Cyclone and Collection Chamber, 230 Volt AU to your wish list.